The development of the Fading Forests Publication Series began in 1991 with a simple phone conversation between Dr. Faith Thompson Campbell and Professor Schlarbaum. As a policy expert, Dr. Campbell had written a manuscript documenting the growing problem of exotic forest pests in North America. She was seeking information on responses of the American chestnut and butternut to exotic pathogens. Professor Schlarbaum offered to review the manuscript and a collaboration spanning more than two decades was born. The following summary describes the first three publications of this series with direct links to each publication. Fading Forests. North American Trees and the Threat of Exotic Pests – 1994, Natural Resources Defense Council: This publication describes the major exotic forest pests attacking North American forests, discusses the risk assessment process, and highlightes flaws in trade policy that would reduce protection against importation of potential pests. 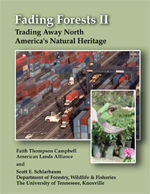 Fading Forests II: Trading Away North America’s Natural Heritage – 2002, Healing Stones Foundation: This publication offers an in-depth policy analysis of the exotic forest pest problem and suggests options to help mitigate this growing problem. Fading Forests III: American Forests: What Choice Will We Make? – 2014, The Nature Conservancy and The University of Tennessee: This publication summarizes the changes in exotic forest pest problem areas that have occurred since 1994, emphasizing events since 2002. Additionally, it explores what additional measures are needed in the future to address this growing problem. Most importantly, Fading Forests III offers a stark look at the choices Americans have for the structure and function of their natural forest heritage.